I know it’s mid-February and we (only?) have another 6 or so weeks for cold weather here in the Philadelphia area, but I’ve been looking at warm, cushy pullovers lately. Simple details, top-down, seamless and with a feminine silhouette. It’s very likely caused by not having heat in our home for 5 days. 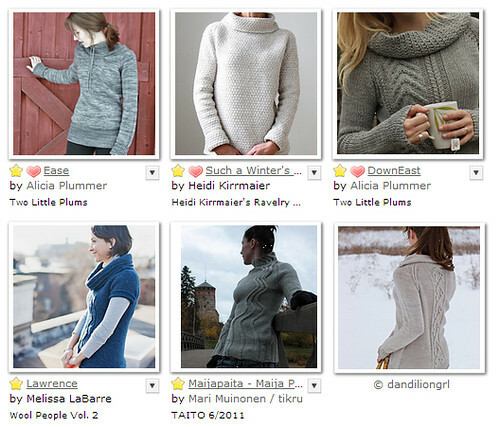 But this morning our house is warm again and the idea of one of these pullovers is still looking like a great idea. So if you’re like me, or if you’re further north and in for a couple month of cold (sorry!) then these might be for you too. And if not, fall is only 7 months away. Miranda by Josee Paquin – love the way the pocket melts into the cable pattern. Sturgeon by Melissa Schaschwary – the deep V and shorter sleeves would also make this a great transitional pullover. November10 by ANKESTRICK – the overlapping V for the hood makes this one functional and stylish. I do however need to mention the pattern instructions. I bought this pattern and the instructions are not clear – no indication of RS and WS, stitch counts that use different ways to count the stitches (in one place you include the raglan sts, and in another you do not but there’s no indication of that change, and numerous others). 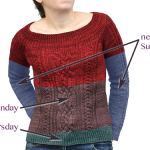 I did CO for this project but I might just use the concept of the neckline and do my own top down pullover. It’s a shame because it’s a cute design. Ease by Alicia Plummer – two neckline options and long ribbed sleeves make this one a go-to all winter. Such a Winter’s Day by Heidi Kirrmaier – look at that cowl! And the combo of the yarn (Brooklyn Tweed Shelter) and the knit-purl texture makes it stand up beautifully. Downeast by Alicia Plummer – Another awesome cowl and love the offset cable down the body. Lawrence by Melissa LaBarre – Yes, another cowl and another Brooklyn Tweed Shelter design. The combo obviously works. 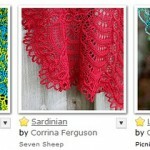 Overlynd by Melissa Schascawary – this one hasn’t been released yet so I’m linking to Melissa’s project page. Love the simplicity of the front contrasted with the deep cables on the back. These are the kinds of pullover I’d reach for every weekend. Now where’s my knitting pixie dust so I can whip one up for tomorrow? it feels that way here in Philly too. i think i might frog november10 (i only had a few rows) and do something else. i don’t have the time (or patience) for poorly written patterns – especially when i have so many gorgeous ones to choose from above! YES ~ all these are perfect for the winter we’ve been having. Yeah we sure have. And then I watch the Sochi Olympics where they’re concerned about the ice melting. Not cool Mother Nature. Obviously I need to live somewhere with temps in the lows, as I am extremely drawn to pullovers and lovely draped collars. You picked some great ones. You think? We both know you were made for 4 seasons. I’m with Andi! Oh how I miss the seasons ?? i do love the seasons too, but it does come with its share of omg – when will this season end? we’re definitely there at this point with the snow. Hi, Jody! I really like “Such a Winter’s Day.” It looks so warm. That’s a cuddle-up-by-a-fireplace-with-a-book sweater. I’m in shawl purgatory/limbo right now. (I actually like the one I’m doing now, but I’m at the point where I just want to get it done!) Then onto a blanket I’m making for my parents for their shore house. I might purchase the pattern so I can start on it by next winter. you’re so much better than i am at keeping your WIPs to a minimum. as soon as i hit purgatory i jump to another WIP (or more likely) a new CO.
blankets are hard to commit to – i give you A TON of credit for all the blanket knitting. 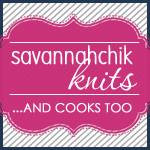 I love that you said, “Fall is only 7 months away.” It’s funny how knitters count down the days to sweater weather.